Neutron imaging has wide industrial and scientific significance and can provide detailed information concerning the inner structure and composition of objects. The principle of neutron imaging is based on the attenuation, through both scattering and absorption, of a directional neutron beam by the matter through which it passes. Since different materials vary in their ability to attenuate neutrons, then both composition and structure can be probed. The neutron beam can be generated either in a reactor, from a neutron emitting isotope or from a target in a proton accelerator. The technique also non-destructive in nature, and has been effectively applied to artifacts of archaeological significance. The neutron imaging technique, rather than being in competition with X-ray imaging, is entirely and ideally complimentary to it. Whereas X-rays are scattered and absorbed by the electrons, and as such atoms with greater electron shells interact more strongly, neutrons on the other hand interact with the atomic nuclei. Furthermore there is no real periodic regularity dictating the degree of this interaction, and even isotopes of the same element may differ markedly in their attenuation ability. Of particular practical significance is the high contrast between hydrogen, which interacts very strongly with neutrons, and most metals, which offer effective transmission of neutrons. This is directly opposed to X-ray imaging, and offers the means to effectively visualize the dynamics of organic hydrogen-containing substances in metal containers, such as the ability to visualize fuel within engines. It can also equally be used to view plastic seals or lubricants embedded within metal structures. The degree of attenuation for some materials can sometimes depend on the neutron energy, fast or thermal neutrons, such is the case with iron. 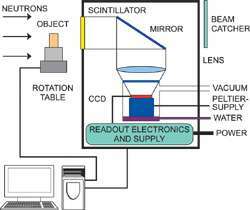 Neutron Radiography involves placing an object in the path of the neutron beam, and measuring the shadow image of the object that is projected onto a neutron detector, often consisting of scintillator optically coupled to a CCD or EMCCD Camera. Neutron Tomography takes this a step further and entails rotating the sample in the beam and recording multiple 2D images through an angular range of 180°. From the data set, a 3D representation through the object can be constructed. Fig. 1 shows a typical system setup. Traditionally CCD’s have been used as imaging cameras for neutron tomography. Andor’s scientific range of imaging cameras are ideal with their extremely low noise, -100 °C cooling and highest QE delivering optimal performance. However, a limitation of CCD’s for some neutron detection applications, such as dynamic processes in real time, can be the effective readout speed of 3-5 MHz. Although this is still extremely effective for monitoring stationary objects or slow processes, due to the features mentioned previously. For the faster framing requirements, or to perform faster 3D tomography (or 4D (3D + time)), a different approach to the camera selection needs to be taken. The Neo sCMOS is one such camera selection that delivers low noise, target field of view and 100 full frames per second rates faster for smaller regions of interest. If the application also requires single photon sensitivity then an EMCCD detector should be selected. 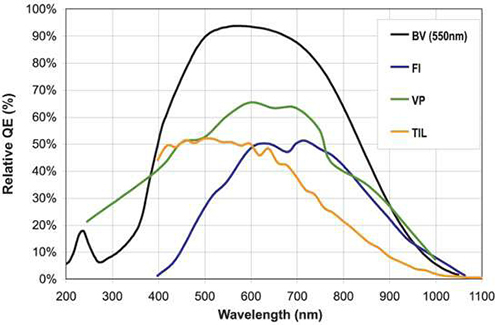 EMCCD detectors offer > 90% QE, as well as single photon sensitivity at frame rates of > 30 full frames / sec. EMCCD enhanced sensitivity and speed opens the door on the ability to follow faster 3D tomography. The EMCCD gained overcomes the inherent optical losses of the system. The QE curves in Fig. 2 and the cameras listed in Table 1 show some of the options available for Neutron Tomography. Fig. 3 shows a virtual slice through a famous bronze sculpture “Mercure from Thalwil”, exhibit of the Swiss National Museum, Zurich, Switzerland. With the help of Neutron Tomography it becomes possible to study inner structure and casting failures completely nondestructively. Neutrons are required because the commonly used X-ray cannot penetrate the alloy, which contains high amounts of lead. Neutron Tomography at NEUTRA facility, Paul Scherrer Institut, Switzerland. Images kindly supplied by Eberhard H. Lehmann of the NEUTRA facility. Fig. 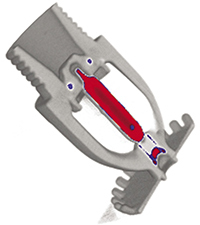 4 – Cross section through a sprinkler nozzle. Fig. 4 shows a sprinkler nozzle, which contains a tube filled with liquid. The sealing rings around it were inspected in-situ (as installed) for quality assurance and a functionality check. Rubber and liquids deliver high contrast for neutrons compared to the metallic structure around. Fig. 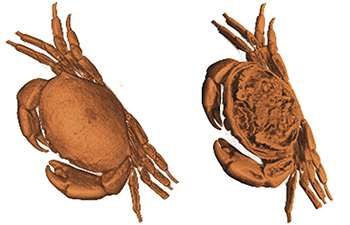 5 – A crab showing the inner organs within the shell. Fig. 5 shows a crab with an outer size of 20 cm, which was investigated to see the inner organs within the shell. Neutrons have high contrast for organic materials.